I’m always on the lookout for unusual macaroni and cheese recipes, but I’m equally happy to find ones that are simple and quick to prepare (i.e., no roux to stir!). 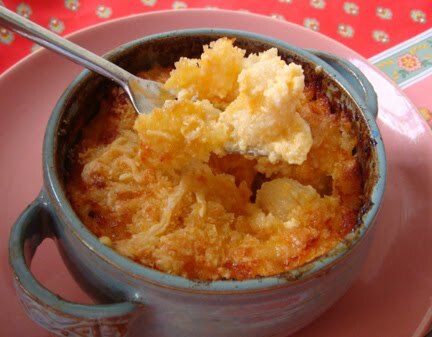 This one, from the recipe files of my friend Adrienne, is definitely in the latter camp although the sour cream is an ingredient I hadn’t yet explored in the mac format, so on an uncharacteristically gloomy May afternoon I decided to give it a try. To be honest, Adrienne and I barely know each other. We’re both involved in a twice-yearly, puzzle-based Disneyland scavenger hunt put together by www.mouseplanet.com . So twice a year a huge group of Disneyland nuts converge for a crazy weekend at the park, and then the rest of the year we amuse ourselves and pass the time between MouseAdventures by chatting on the MousePad message boards about all kinds of stuff, including food. I’ve never had the pleasure of sampling any of Adrienne’s cooking but her reputation for kitchen excellence looms large, and I had full confidence that this recipe would not let me down. Plus, she’s got three young sons, so if this dish is a family favorite in Casa de K, it must have something going for it. At the last minute I had to substitute some Jack for the Mozzarella (both of which are mild and stretchy) because what I’d identified as a lump of Mozzarella in the freezer turned out to be Asiago, and while they are both Italian cheeses, I felt the Asiago would add an assertive flavor that might be out of place, while failing to provide the meltiness that makes Mozzarella such a star. Other than that, I followed Adrienne’s recipe to the letter. Here’s a fun fact: When a brick of Cheddar thaws after a stay in the freezer, you’ll be able to crumble it effortlessly with your fingers. No grating! 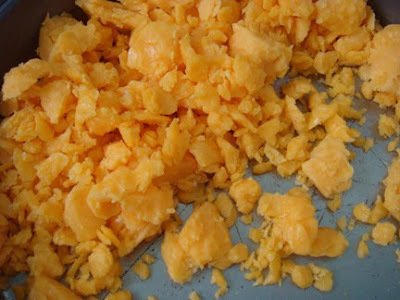 Of course, this results in some rather unevenly chunky cheese lumps which may not meet everyone’s aesthetic standards. My primary objective was to get in and out of the kitchen with the least muss and fuss, so I was glad to avoid washing a gunky grater. A happy accident. To achieve the necessary quantity of Cheddar, I combined white Tillamook Extra Sharp and yellow Fresh & Easy store-brand sharp, both of which I’ve used many times and both of which were in the freezer for at least a month. I did not notice any flavor degradation whatsoever, although the uncooked cheese’s crumbly texture was definitely weird. Unlike the New York Times macaroni and cheese, our first entry that employed cottage cheese, this recipe does not instruct you to liquify the wet ingredients in a blender. If your cottage cheese has large curds you might want to zap it anyway – especially if you are trying to sneak the cottage cheese past a picky eater, as white curds were clearly visible in the finished mac. But given a choice between washing a blender and suffering white blobs in my mac, you know which one I’ll pick every time! After the initial 35 minutes in the oven, this macaroni and cheese looked fantastic – all bubbly and gooey and starting to brown as I carefully removed it from the oven to add the crowning layer of bread crumbs and reserved cheese. Adrienne’s recipe says to return the topping-adorned baking dish to the oven for another 5 minutes to melt the cheese, but I found that 5 minutes resulted in an anemic appearance and not enough meltage so I cranked the temp to 425 and monitored it through the oven window until it browned to my liking. Et voila! The topping yielded a gentle crunch as my fork went through it. I love that sound! Since this recipe includes an egg, the mac interior was more custardy than saucy, but the tangy sour cream and cottage cheese kept things moist and added a little complexity to the sharpness of the Cheddar. The flavor was nice and bright, very cheesy tasting yet suitable for delicate or finicky palates. But if you were in an adventurous mood, you could use this easy formulation as a jumping-off point for all kinds of variations. Adrienne admits, “Sometimes I put cauliflower in the pasta water about halfway through the pasta cooking time. I love sneaking vegetables into my kids. My middle son wishes I would not add the cauliflower but they all still gobble it up.” Considering there's no butter in this mac and you could opt for lowfat or nonfat cottage cheese and sour cream, this macaroni and cheese practically qualifies as health food! ...Okay, maybe not, but you can still be very pleased about serving your family such wholesomeness. I think I’ll add some blue cheese the next time I prepare it – you know, kinda roll with the sharp ‘n’ tangy thing -- and maybe toss a sprinkle of chives into the cheesy bread crumbs, for color as much as for taste. But I agree with Mr. Adrienne: it’s already delish as written below. Thanks, Adrienne! Cook pasta according to the directions on the box; drain. 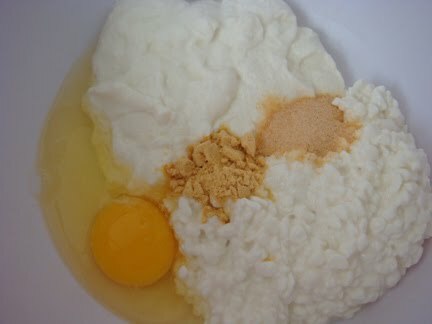 In a large mixing bowl, combine sour cream, cottage cheese, egg, mustard and garlic powder. Stir in 2 cups of Cheddar and 1 cup of Mozzarella and the drained noodles. Place mixture in a baking dish. Bake at 350 degrees for 35 minutes. 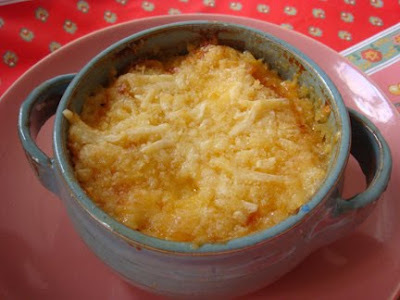 Combine additional cheeses and bread crumbs, and sprinkle on top of the mac and cheese. Return baking dish to the oven and continue to cook until topping is golden brown.